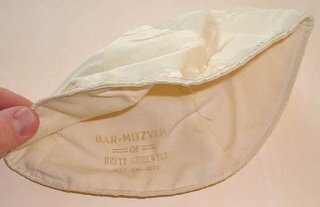 The Rabbi with a Blog (Rabbi Jason Miller): A very expensive yarmulke! "Bar Mitzvah of Brett Gurewitz | May 24, 1975"
I wonder if anyone would be interested in a signed copy of my Bar Mitzvah haftorah? I surely wasn't selling my bar mitzvah kippa rather, as far as I can tell, these have been sold from time to time by opportunistic memorabilia collectors (one with seemingly antisemitic proclivities I might add).